A new US rule banning airline passengers carrying cigarette lighters has revived a debate over tighter travel security. The ban, which comes into force on Thursday, was first debated after Richard Reid, the so-called "shoe bomber", tried unsuccessfully to light explosives hidden in his shoes on a trans-Atlantic flight in 2002. In the pipeline is a computerised screening system - Secure Flight - which has raised questions over the balance between security and privacy. Industry experts say that while travellers continue to be hit by anti-terrorism measures, gaping flaws still exist in other areas. David Rowell, editor of The Travel Insider, said: "You can't take a cigarette lighter onto an aircraft, but security in the hold is virtually non-existent. How far have we gone where people don't want to air their views for fear of ending up on some kind of terrorist watch list? "We have to accept some compromises for security - but travellers need to feel the real issues are being addressed." Earlier this month, the head of the agency responsible for airline security in the US resigned after warnings that aircraft were still at risk from terrorist attack. Transportation Security Administration (TSA) chief David Stone quit after just eight months in the job, the third such boss to resign since the 11 September 2001 attacks. The TSA has spent more than $12bn since the 2001 attacks on improving security, including new baggage screeners, more air marshals and making cockpit doors bullet-proof. But confidence in the body was shaken in March by a leaked report by the Department of Homeland Security and FBI that found airlines remained at risk of terrorist attacks, despite security improvements. Another study by the Coalition of Airline Pilots - dismissed as a "publicity stunt" by the TSA - warned of "gaping holes" in aviation security. The US government's spending watchdog has also criticised the TSA for "operational inefficiencies" in the way it deployed machines to screen baggage for explosives. And one former high-ranking TSA official told the BBC that over-zealous officials were causing "a lot of nasty PR problems" on the ground. "There is a different mindset between the air carriers, the airports and federal government," said the official, who spoke out on condition of anonymity. "You have got a lot of wannabe cops among the screening teams - you get queues and delays which turn into complaints and bad publicity. "Airports are being fined for the slightest breaches - like a fence an inch out of place - by people who are justifying their jobs. "The TSA doesn't know where it is going - and those in Congress don't understand the industry and how it works." While security checks can be a source of friction between travellers and screeners, the proportion of delays caused by security problems is relatively low. 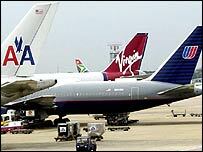 In February 2005, there were just 214 such delays out of 545,332 flights, Department of Transport figures show. But these figures do not account for the extra time passengers must set aside to get past tougher security checks. 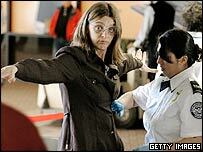 The TSA says its own research suggests travellers are highly satisfied by security screeners. Between 80% and 95% of passengers gave positive responses when asked about aspects of the federal security screening process, it says. And it has introduced a seven-point "pledge to passengers" to address concerns over customer service. But the post-9/11 emphasis on airline security does appear to have created an image problem. Mr Rowell says many readers email him saying they are too scared to complain about security issues. "How far have we gone as a society where people don't want to air their views on something for fear of ending up on some kind of terrorist watch list?" he added. I flew to the US and back last week and had nothing but trouble on the way in and out. 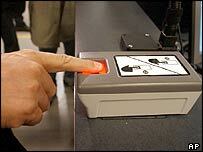 UK citizens are now required to give left and right index fingerprints and have their photo taken on entry. I have an electronic artificial left arm so can't give a fingerprint. It took them half an hour of being kept in secondary immigration for them to work out how to cope with someone who couldn't give a fingerprint. On the way out my metalic hand set off the arch and they refused to accept that and let me pass after a detailed frisk. I was taken away, had to take my arm off and have it x-ray scanned, and also had it swabbed and checked for explosives. Welcome to America! It really annoys me when the "security" at airports stops you for having nail clippers or a small cork-screw in your hand baggage. They continue to allow people to carry on glass bottles of spirits from duty free. Which would do the most damage if pushed into someone's face - nail clippers or a broken bottle? However, the airports don't make money out of nail clippers and cork-screws, do they? Whilst inevitably you do get the occasional over-zelous screener I generally find the screening process here to be painless. Ultimately I don't care how rigourous or intrusive screening is as long as my flight is safe. It is all a show. What really matters is what we can't see. More excuses for eroding civil rights and liberties. We can thank the Bush administration for this mess. I am satisfied with the additional security measures, although every time I need to travel through the USA I cringe. The USA security officials behave like renegade police, are never happy, and hassle passengers all the time to just show their own authority and power. It does not convey a good image of America. I think that if it is keeping us safe then people should lose there preconceived views about privacy. Have we forgotten Oklahoma City that utilized a truck bomb? Or the first World Trade Center (truck again!). How much security has been placed on our shipping cargo? If extremely dangerous weapons are going to be brough into the USA, its not going to be via the airlines but by trucks and ships. Put the security emphasis on where it is needed most, not where it is most visible! Please do the Security measures. It is necessary in this day and age. We have no choice. It is better to take some time to go through the security measures than to be killed by the terrorists. These extra security measures are ridiculous, a cigarette lighter is banned and matches are not! Where is the sense in that? It will just cause more delays and illwill from travellers, especially all those suffering from nicotine withdrwal and no lighter at the end of the journey!! It's funny how they check for sharp objects in your hand luggage, yet hand you real knives and forks in Business Class. Do airlines assume that "real" terrorists are on a tight budget, and wouldn't cough up the extra £2k?! My wife and I recently retired and left the US to avoid what we see as a foolish over-reaction in America to the 9/11 attacks. We avoid US airlines and airspace when we travel.